Mmmm. Pig run! 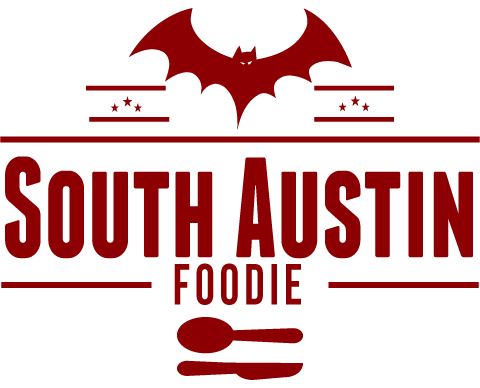 To the best baby back ribs in Austin, in my humble opinion! Artz Rib House has been a fixture on South Lamar for years. They recently put up a snazzy new sign by the street with flames, and are also known for their support of local Austin musicians, with live music practically every night. The tables are covered in red & white checkered table cloths, and empty bottles of hot sauce now double as toothpick dispensers. It's a comfortable, fun, non-pretentious place. Service pretty much is always friendly, and the food comes fast. I am slightly embarrassed that it's taken me 6 months to write about the place, because it truly is one of my favorite places in town. I spent my birthday dinner there last night with a group of good friends. I am sorry I didn't catch the name of our waitress, but she was really great, especially dealing with a group of like 15 people, half of whom substituted the "normal" sides for something else. She seemed always present, but not hovering, and was happy to split checks up at the end of the meal, something they say they don't normally do. 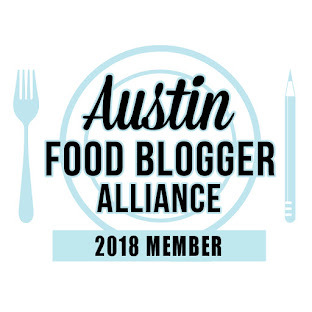 I am completely biased towards their mesquite wood smoked baby back ribs, and I really truly think they are some of the very best in Austin. They are meaty, tender, flavorful, have a nice smoke ring, and all around, just can't be beat. 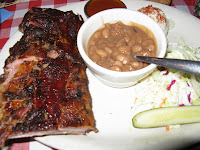 The BBQ sauce is served on the side, and the standard sides for the meat plates are pinto beans, a creamy potato salad, and a non-creamy cole slaw, and a piece of bread. Last night, I thought the cole slaw was drier than normal; I think it's usually got a bit of a vinaigrette dressing on it. I do love the potato salad though! The potatoes have been mashed a bit, and they're not drowning in dressing. I should have taken a picture of my plate at the end of the meal, because I pretty much licked all those ribs clean! Pity the fool who won't use their hands to eat! I can polish off that half rack of ribs pretty darn well. At my end of the table, there were no complaints about any of the meats, and immediately around me were the pork chops, smoked turkey, and sausage. The veggie kabob can be substituted for the sides, and it got high remarks too. One friend who is pregnant got a cup of the smoked chicken noodle soup that was on special, and thought it was too salty. Her husband tried it, and said it was a bit salty, and while I didn't try it, we did mention the possibility that it also could be because her hormones are wacky right now... I think she did eat the whole cup though! Bottom line, go get you some ribs!